Yep, I'm still here. While there haven't been updates on this blog, I've still been busy behind the scenes, reading submissions and just about everything else to do with the third issue of MYTHIC. Our second installment is almost ready to debut but we wanted to give our readers a peek at what's coming down the road. Thanks to our Facebook page followers for your interest in what we're doing. Also, another shout out to our current subscribers. We're working for you to deliver your issues as quickly as possible. To those still undecided, take a chance with us. We're working to make a great magazine of science and fantasy literature. 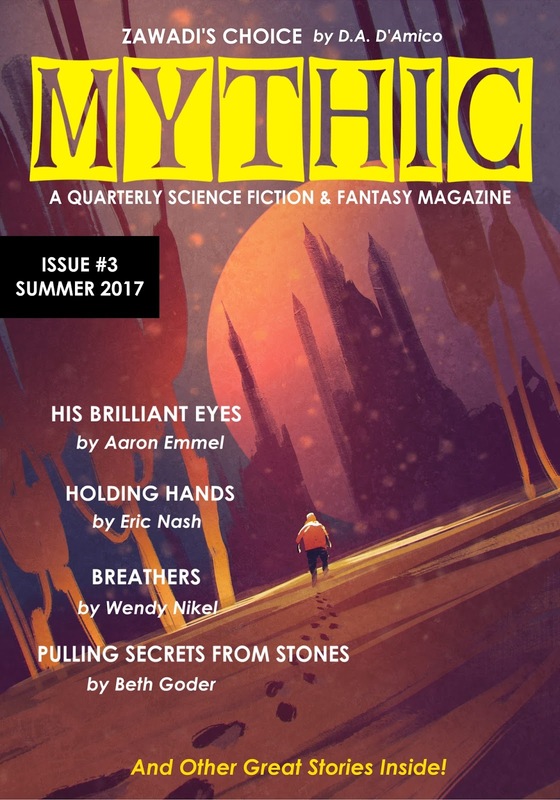 Still, to make MYTHIC a better magazine we put out a call for your help. Consider subscribing to MYTHIC today. Or perhaps, support us via Patreon. Or even just a one-time offering of aid with the Paypal button on our website. Thanks. In the meantime, check out the cover of Issue #3!